Visit Google Zeitgeist for the search terms. Originally known as St. Stephen’s Day, what exactly is all the excitement about Boxing Day? Traditionally, it is December 26th, and is celebrated in England, Canada, Australia, and most other countries in the Commonwealth. No one is sure where the name comes from. It could be because the upper class used to give its lower class servants and serfs gifts on this day. 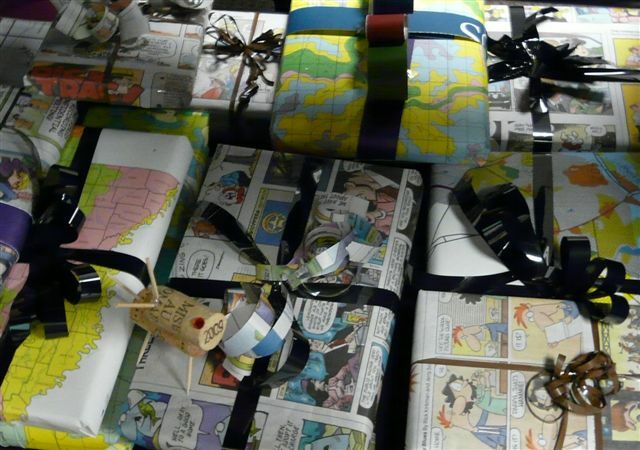 These gifts were most likely placed in boxes. Christmas was reserved for sharing gifts among equals, and Boxing Day could have been started with the rich giving thank you presents on the day after Christmas. Or it could be called Boxing Day, because so many people have empty boxes the day after Christmas. Either way, it sounds like a day where people gather with friends, leftovers, football (soccer), and go to the pub. If it falls on a weekend day, it is pushed back to the following business day. 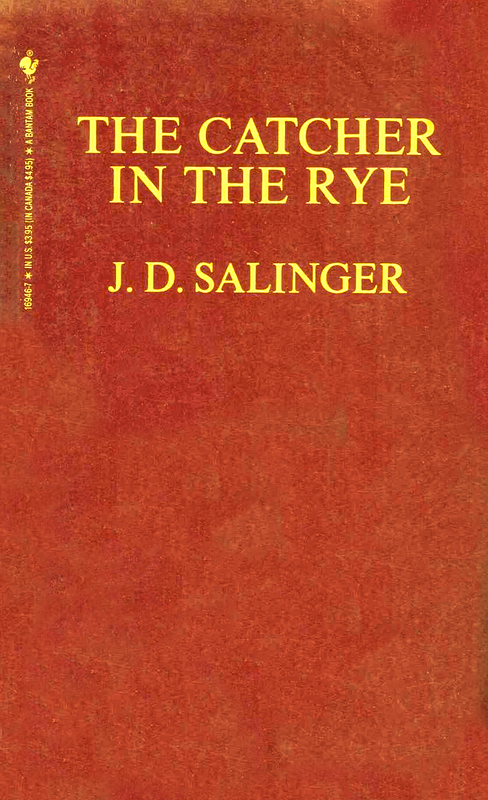 Today is, also, when the nobility and the rich conduct their infamous fox hunts. They saddle up their horses, release the hounds, and start the hunt. In 2005, the practice of the dogs taking down the foxes was outlawed. Now, they just hold the foxes until the hunters can finish the job. Wait, there’s more! 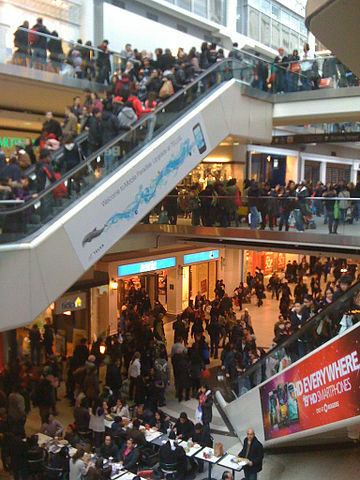 Stores usually conduct steep sales on this day, as shoppers are already in the stores for returns. As the economy has weakened in the past years, stores have extended these sales past Boxing Day. Sound familiar? It is a parallel to the day after Thanksgiving or “Black Friday.” It’s a time for shopping, eating leftovers, watching a sport, and gathering with friends (as you’ve spent time with the family already). So grab your leftovers, friends, and watch some sports on T.V. (after all it is Winter Break), and have a happy Boxing Day! Orville and Wilbur Wright were brothers famous for the first heavier than air, self propelled aircraft flight. They never went to college and started out as owners of a bicycle repair shop in Ohio. They built bicycles, ran the shop, and dreamed of building aircrafts. This dream led to exhaustive research on aircraft developments. Based on German engineers’ designs, they looked for a perfect site to test out their new ideas. On the recommendation from the U.S. Weather Bureau, they chose Kitty Hawk, North Carolina. as the perfect site to test their ideas out. They even built their own wind tunnel to test wings and airframes. By early 1903 Orville and Wilbur perfected their designs. They just needed an engine. Their single combustible engine was built by machinist Charles Taylor. With all of the different components ready, they transported them separately to Kitty Hawk, before assembling. The first test was on December 14th, 1903. The airplane did not pass the take-off phase as the engine stalled. The brothers worked exhaustively on the repairs before it was finally ready for a second test 110 years ago today, December 17th, 1903. This time the airplane lifted off the ground, flew 120 feet in 12 seconds, before landing safely. They were able to fly it three more times that day, with Wilbur flying the last test at 852 feet in 59 seconds. The brothers went on to form the Wright Company in 1909. Their first plane is on display at the National Air and Space Museum in Washington, D.C.
For more information on the Wright Brothers, take a look at the Rebecca Crown Library’s collection. References: First airplane flies. (2013). The History Channel website. 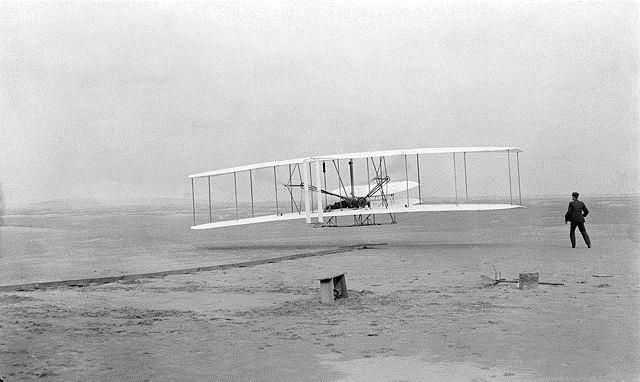 Retrieved 11:21, December 17, 2013, from http://www.history.com/this-day-in-history/first-airplane-flies. In collaboration with 4RFuture, Dominican University’s Sustainability Initiative, the Rebecca Crown Library is proud to present the Second Annual Sustainable Christmas Display. All items on display have been constructed using recycled or re-purposed materials. 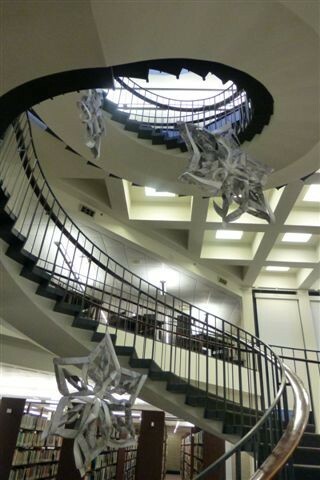 The large snowflakes hanging in the central staircase were constructed from old government maps of Illinois that were withdrawn from the library collection. 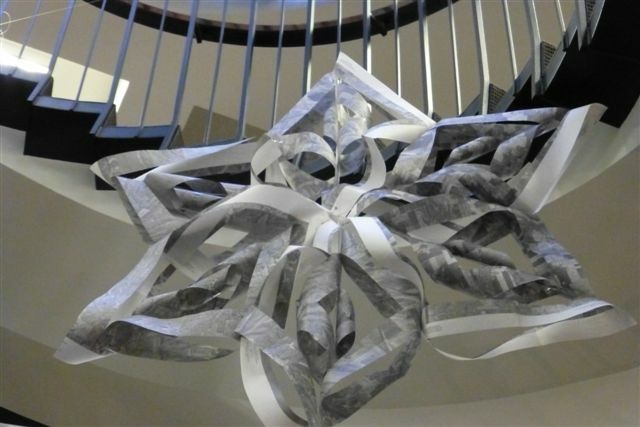 The tree, featured in a previous post, is adorned with garland made from the recycled covers of 24 volumes of Index Medicus, as well as snowflakes made from the pages of books withdrawn from the collection. Surrounding the tree are books from our giveaway table that have been wrapped in recycled newspaper and old maps, and bound with ribbon made from old cassette and VHS tapes. Mini-trees have been placed on all of the study tables in the library. 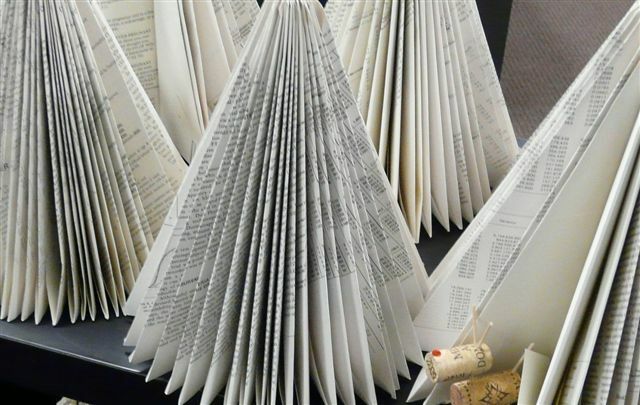 These trees were made from volumes of Environmental Health Perspectives and Vital & Health Statistics, government documents that were withdrawn from the collection. Our display was designed by Bryan Deziel, Jill Bambenek, and Elena Maans. Special thanks to the following library staff and student employees for their assistance with the construction of the display: Bryan Deziel; Sharon Tobin; Kitty Rhoades; Rosa Martinelli; Patrick Hussey; Amanda Jachec; Gabby Vazquez; Jill Metcalf; Miranda Skeehan; Tori Goodman; Imani Davis; Brianna Martin; Maia Martin; Monica Tamrazi; Kelsey Keithly; Kassandra Cruz; AJ Stites; David McCullough; and Kate Marsh. 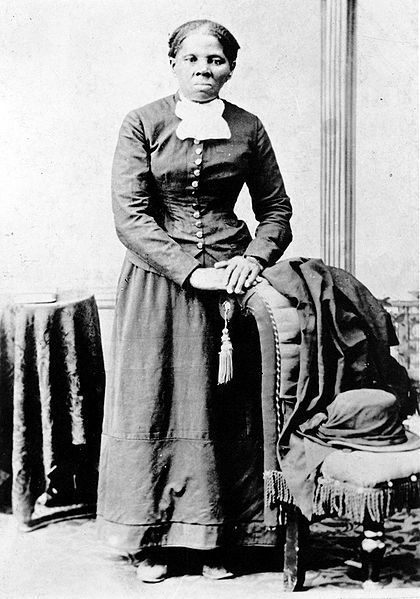 Harriet Tubman was an African-American abolitionist who was born into slavery in 1820. She is best known for her development and execution the Underground Railroad. On this day December 6 in 1849 she succeeded in her second and final escape from slavery in Maryland. Over the next eight years, Tubman spent her time executing the secret Underground Railroad which ultimately freeing over 300 slaves. She was also the first woman to lead an armed expedition during the American Civil War (or any war for that matter) in the Combahee River Raid, freeing over 700 slaves in South Carolina and later became a strong advocate for women’s suffrage. For more information on Harriet Tubman, take a look at the Rebecca Crown Library’s collection.